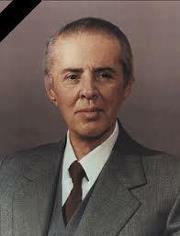 With great sorrow and deep grief we inform you that today, on 11 April 1985, at 02.15 hours, the heart of the beloved and glorious Leader of the Party and our people, Comrade Enver Hoxha, First Secretary of the Central Committee of the Party of Labour of Albania, Chairman of the General Council of the Democratic Front of Albania, General Commander of the Armed Forces of the PSR of Albania, ceased to beat. The founder of our glorious Party, the organizer and leader of the National Liberation War and our people's revolution, the architect of the construction of the new socialist Albania, departed from us. The heroic Commander of our National Liberation Army, the Man who created the Democratic Front and laid the foundations of the People's Power, closed his eyes. The life and work of Comrade Enver Hoxha is the living history of the present-day Albania. His name is connected with all the class battles and all the victories of the Party and the Albanian people. His thought and personality have always been present in all the stages through which our people have gone, from the day when the Communist Party was founded to this day, at any moment when the fates of the people and the Homeland hung in the balance. His leadership and guidance have been decisive at all the key moments when decisions were made on the course to be followed and the battles to be waged. 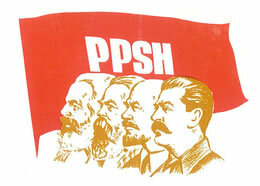 the Communist Party, the only staff capable of uniting the people and leading them in the war for the liberation of Albania and the establishment of the people's power. His great historic merit is the creation of this staff, of strengthening it organizationally and educating it ideologically at the very grave moments of the fascist occupation and oppression, and the betrayal of the nation by the old political forces. At the head of the Party, He drafted and worked out the general political line of the National Liberation War, found and defined the roads to the achievement of the victory of 29 November 1944, in fierce clashes with external and internal enemies, with opportunists and factionalists. Under the leadership of Comrade Enver Hoxha, the Party united the Albanian people in the National Liberation Front. He was the initiator and organizer of the historic Conference of Peza. For the first time in their history our people achieved their fighting unity on the basis of a platform which expressed their genuine desires and aspirations. It was this unity which faced up to the savage forces of the fascist occupiers and traitors to the country. borders of Albania, and with the support of the patriotic forces of the whole people, liberated our beloved Homeland. The people's power and the new Albanian state, which were born in the heat of the National Liberation War, are built on the revolutionary thinking and leading activity of Comrade Enver Hoxha. Under His care and according to His teachings, the people's councils became the powerful weapon of the dictatorship of the proletariat, of the democracy for the masses, and of the construction of socialism. Comrade Enver Hoxha drafted and worked out the program of magnificent transformations and the construction of the new socialist society. The victorious battles for the industrialization of the country, the building of all the monumental projects which gave the country its new working class and a powerful base for its all-round economic and social development, were waged under the leadership of the communists, with Comrade Enver Hoxha at the head. Relying on Marxism-Leninism and knowing the sufferings and centuries-old aspirations of our patriotic peasantry, Comrade Enver Hoxha gave the fundamental orientations for the collectivization and modernization of agriculture. The correctness of the road mapped out by the Party is clearly seen in the present reality of our cooperativist village. Comrade Enver Hoxha led the Party and the people in the deep-going ideological and cultural revolution which has been carried out in our country. If Albania today is an advanced socialist country which develops on its own forces, the land of people freed from any social and spiritual oppression, the land of democracy and well-being for all, of education and culture for the broad masses of the people, all this is due to the struggle which the Albanian people have waged with the Party and Comrade Enver Hoxha at the head. Enver Hoxha have not been manifested. He has worked out the general line of the foreign policy and stands of our Party and state over international questions. This policy, firm opposition to American imperialism, Soviet social-imperialism and world reaction, sincere support for the revolutionary and liberation struggles of the peoples, and solidarity with the democratic and anti-imperialist forces, has strengthened the international position of our country, has increased the sympathy and respect for socialist Albania in the world, has increased the number of its friends and well-wishers. Under the leadership of Comrade Enver Hoxha, the Party of Labour of Albania has waged a heroic struggle against modern revisionism. No one has defended the teachings of Marx, Engels, Lenin and Stalin against opportunist distortions with such great revolutionary feeling, at any time and in any situation, as he did, no one has exposed the social-imperialist and social-chauvinist policies and activities of the Titoites, the Khrushchevites and other renegades, as he did. No one has fought with such energy and determination against the internal enemies of the Party, the factionalist groups and foreign agents from Koçi Xoxe to the gang of Mehmet Shehu, as he did. This struggle has saved our Party, people and Homeland. of our new society, His analyses of the processes of current world development and their conclusions of great ideological value, serve as bearings and reference for the day-to-day revolutionary activity. As a true internationalist, He has tirelessly supported the new Marxist-Leninist parties and their revolutionary struggle, has always stood by them and attentively followed their struggle for their consolidation and advancement. Comrade Enver Hoxha is the greatest historic figure of our people and nation, which will illuminate the road for the present and coming generations with its undying light. He will live for ever beloved, honoured and respected in the hearts of all the communists and our people. With His Work and teachings, He will always stand by them in order to inspire them in their struggle and work for the good of the Homeland and communism. «Let us guard what we have achieved as the apple of our eye, let us go on consistently to develop it further, to leave the coming generations an Albania ever stronger, always red, like the undying flame of the hearts and ideals of communists and partisans, an Albania which will live and progress through the centuries. I am convinced that the people and the Party will raise our triumphant flag higher and higher, will raise the honour, prestige and name of socialist Albania higher and higher in the world,» remain always our battle flag. This is the unanimous pledge which our Party of Labour and the whole Albanian people take today. round the Party and its Central Committee, let us mobilize even more our forces so as to make our Albania what Comrade Enver Hoxha wanted it to be, strong, prosperous and advanced, let us work tirelessly as He worked and fought for half a century on end in order to raise its name ever higher. 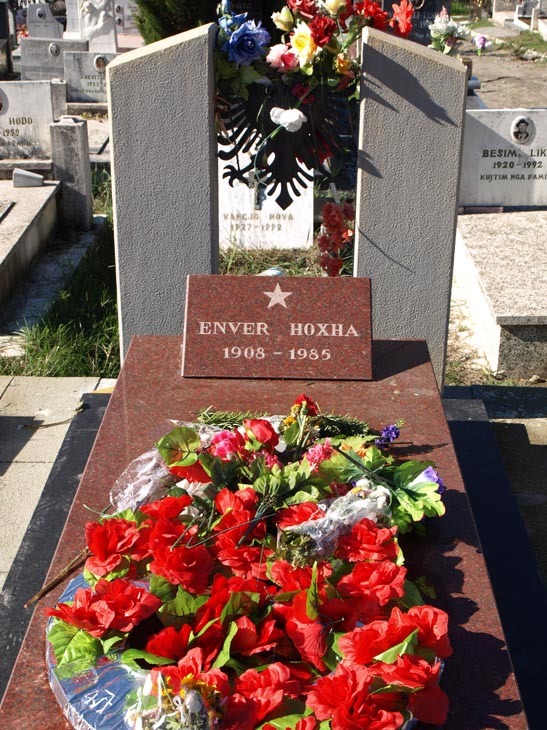 Glory to the brilliant and immortal Work of Comrade ENVER HOXHA!